Internet Password Lock is a software program for Windows (does not work on Windows 95/98/Me) that allows you to block, control and restrict Internet access. This includes Web browsing and surfing, Instant Messaging, and email. Parents can use Internet Password Lock to protect your children by making sure children do not use the Internet without a parent present. Businesses can use Internet Password Lock to lock out unauthorized Internet use and save money by preventing employees from wasting time on the Internet. Internet Password Lock is available as shareware. Try it for a month to see if you like it before you have to pay for it. Just download the install file to your computer, then run the file like a program by double-clicking on the install file in Windows Explorer or My Computer to install Internet Password Lock. Remember that complete instructions are provided for uninstalling Internet Password Lock if you decide that you do not like it. Click here or click here to download the installation program (iplarc.exe). The cost if Intenet Password Lock is $20 for an individual license. Volume discounts available. For information on volume discounts, use the calculator below. Internet Password Lock is a software program for Windows (does not work on Windows 95/98/Me) that allows you to password protect all access to the Internet. This includes Web surfing, Instant Messaging, and email. Parents can use Internet Password Lock to make sure their children do not use the Internet without a parent present. Businesses can use Internet Password Lock to lock out unauthorized Internet use. Once Internet Password Lock is installed, all Internet access will be blocked when Windows starts. To access the Internet, you must view the main Internet Password Lock screen by clicking on the Internet Password Lock icon on the system tray and then input a password (selected by you when you install Internet Password Lock). You can then access the Internet freely until you lock the Internet again using Internet Password Lock. There will also be an icon for Internet Password Lock on your desktop screen along with the other icons. Double clicking on this will also display the Internet Password Lock main screen. When you first run Internet Password Lock, it will ask you to set an administer password. Once you set the administer password, it will ask you to set a supervisor password. The administrator password is required to uninstall Internet Password Lock. The supervisor password can be used to temporarily turn off Internet Password Lock. Note: Passwords are case sensitive. This means, for example, that "Good" is not the same as "good" or "GOOD". Be sure to remember the EXACT password you select, including capitalization. Next, Internet Password Lock will display the Configure screen to ask you to configure what protections you want to setup. You do this by checking the boxes for the types of protection you want. One method to prevent Internet access is to block ports. This block all access to other computers, including the Internet and local area networks (LANs). It is best to enable this blocking, unless your computer is on a network and you need to be able to access files or printers on this network even when you are not on the Internet. If you do need to access a LAN while Internet Password Lock is blocking the Internet, you should not activate the port blocking. You would also not use this method of Internet blocking if you only wanted to block some types of Internet access. For example, you should not block IP addresses if you want to allow email but not Web surfing. If you do activate port blocking, you can choose if you want to have automatic relocking. This means that Internet Password Lock will periodically check to make sure that the IP addresses are still blocked. This is because some computer knowledgeable people might be able to figure out how to unblock the IP addresses. However, with IP addresses automatically being relocked by Internet Password Lock, they will be unable to do this. If you are blocking IP addresses, activating automatic relocking is highly recommended. A second method of preventing Internet access is to disable programs on your computer that are used to access the Internet. These programs are Web browsers (used to view Web sites), email programs (used to send and receive email), and instant messaging programs. Internet Password Lock also considers chat programs to be a form of instant messaging program. If you activate any of these protections, Internet Password Lock will actually shut down any of these programs that people try to run. Note that this system is not perfect. (How many things in life are?) It is possible that Internet Password Lock will sometimes shut down a program that is not one of the ones it is supposed to block. For example, if you have selected to block. For example, if you set Internet Password Lock to block email but not Web browsers, Internet Password Lock might shut down a browser if you where looking at a Web site about email because it might mistake that site for an actual email site like Yahoo! Email. It is also possible that Internet Password Lock might fail to shut down a program that it should, if that program is unknown to Internet Password Lock. If that happens, please contact Leithauser Research at Leithauser@aol.com to report the problem so that we can fix it. If you do decide to use this form of Internet blocking, just click on the box for each specific form of Internet activity that you want to block. You can remove any form of blocking by clicking on any box that is already checked. When you are finished selecting the forms of Internet blocking that you want to use, click on the Save button or press the Enter key on your computer keyboard. If you decide not to change any of the settings, you can just click on the Cancel button or press the Esc button on your keyboard. Once Internet Password Lock is installed, its icon (which looks like a key in a lock) will appear on the Windows system tray in the lower right corner of the screen. Click on this icon to display the main Internet Password Lock screen. There will also be an icon for Internet Password Lock on your desktop screen along with the other icons. Double clicking on this will also display the Internet Password Lock main screen. However, this is not the preferred method of displaying the screen. 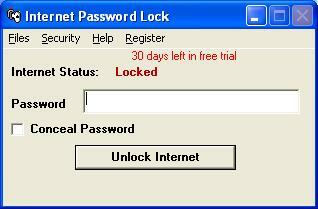 From the time you first run Internet Password Lock, you have a 30-day trial period to evaluate it. During that time, Internet Password Lock will be fully functional. If you decide you like Internet Password Lock, you should register and pay for it ($20). At the end of the trial period, if you do not pay for Internet Password Lock and input the unlock code you receive, Internet Password Lock will be deactivated. That is, it will no longer block access to the Internet. It will be reactivated when you input the unlock code, which you will receive when you pay for Internet Password Lock. There are several ways to pay for Internet Password Lock. The easiest way to register a single copy is to go to the LeithauserResearch.com site. From there, you can go to the payment page (links are in the third paragraph on the home page). Scroll down the page to the place where Internet Password Lock is listed. Input the serial number that appears on the registration screen for Internet Password Lock (the screen that asks you to register and input your unlock code) and then click on the "PayPal buy now" button. You will be sent the unlock code by email. You will normally receive this code within a day, although it may take a little longer under unusual circumstances (Internet problems, etc.). You can also pay for Internet Password Lock by clicking on the Print button to print a form. You can then mail this form to the address given on the form or fax it to the fax number given on the form. You can pay by enclosing a check or by filling out the credit card information on the form. You can also pay by phone using your credit card. The number to call is 386-410-6769. The main screen (which you display by either clicking on the Internet Password Lock icon on the system tray or by double clicking on the icon on your desktop screen) always displays the current Internet status (either locked or unlocked). There are also some menus at the top of the screen, which will be explained later in this instruction manual. When the Internet is locked, the main screen has a text box for you to input a password, a button that reads "Unlock Internet", and a check box labeled "Conceal Password". In order to unlock (allow access to) the Internet, you must type a password (either the administrator or supervisor password) in the text box and then either click on the "Unlock Internet" button or press the "Enter" key on the keyboard. Note: The password is case sensitive. This means, for example, that "Good" is not the same as "good" or "GOOD". Be sure to use the EXACT password you selected when you set up the password, including capitalization. If the "Conceal Password" box is checked, the characters you type in the text box will be displayed as asterisks. This is useful to prevent someone from seeing the password as you type it. Once you input the correct password and press the "Unlock Internet" button, the Internet will be unlocked and the main screen will change to the Internet unlocked mode. When the Internet is unlocked, the main screen will display only the button, which will be labeled "Lock Internet". Clicking on this button will lock (block access to) the Internet again. You do not need a password to lock the Internet. There are two options under the Files menu. Uninstall Internet Password Lock. If you select this option, Internet Password Lock will ask for the administrative password. If you provide the correct password, Internet Password Lock will be totally removed from your computer. You should only use this option if you have decided that you do not want to use Internet Password Lock ever again. This is the ONLY way to uninstall Internet Password Lock. Please do not try to uninstall Internet Password Lock by manually deleting files. Doing so will not only not uninstall Internet Password Lock, it will make it very hard to actually uninstall. The second option under the Files menu is to exit Internet Password Lock. This deactivates Internet Password Lock controller, and stops Internet blocking. This option displays the Internet access blocking configurations screen. This screen allows you to set which methods of protection you want to use to restrict access to the Internet. You do this by checking the boxes for the types of protection you want. One method to prevent Internet access is to block IP addresses. This block all access to other computers, including the Internet and local area networks (LANs). It is best to enable this blocking, unless your computer is on a network and you need to be able to access files or printers on this network even when you are not on the Internet. If you do need to access a LAN while Internet Password Lock is blocking the Internet, you should not activate the port blocking. You would also not use this method of Internet blocking if you only wanted to block some types of Internet access. For example, you should not block IP addresses if you want to allow email but not Web surfing. For maximum protection, it is recommended that you use BOTH forms of blocking. Another option you can set on the Configure screen is whether to hide the Internet Password Lock icon from the system tray. Normally, you definitely want this icon on the system tray. Clicking on this icon is how you bring up the control screen to disable Internet Password Lock so you can get on the Internet, not to mention other functions like uninstalling Internet Password Lock. However, you can also display this screen by double clicking on the Internet Password Lock icon on the desktop, and some people have requested that it be possible to hide the Internet Password Lock from the system tray to make the program less conspicuous. Therefore, if you really want to eliminate the Internet Password Lock from the system tray, you can check this box. Just be aware that it will be harder to access the Internet Password Lock control screen once you have done this. In addition to showing the icon that displays the Internet Password Lock control screen on the system tray, you can have an icon appear on the task bar, like other programs. This option is available mostly because some computers are a little quirky about the system tray and do not always show the icons properly. If this is the case on your computer and it is not showing the icon properly on the system tray, you will have trouble accessing the Internet Password Lock control panel. In that case, check the Show on Task Bar box so that an icon labeled IPL will appear on your task bar and you can access the Internet Password Lock control panel by clicking on this icon on the task bar instead of the one on the system tray. When you are finished configuring Internet Password Lock, click on the Save button or press the Enter key on your computer keyboard. Changes you make will not take effect until you click on the Save button. If you decide not to change any of the settings, you can just click on the Cancel button or press the Esc button on your keyboard. 1) Change Administrator password - This lets you change the administrator password. If you select this option, it will first ask you for the current administrator password. Note: The administrator password is case sensitive. This means, for example, that "Good" is not the same as "good" or "GOOD". Be sure to use the EXACT password you selected when you set up the password, including capitalization. Once you input the correct current administrator password, it will ask you to select a new administrator password. 2) Change Supervisor password - This lets you change the supervisor password. If you select this option, it will first ask you for the current supervisor password. Note: The password is case sensitive. This means, for example, that "Good" is not the same as "good" or "GOOD". Be sure to use the EXACT password you selected when you set up the password, including capitalization. You can input either the supervisor or administrator password here. This allows the administrator to change the supervisor password if necessary. Once you input the correct password, it will ask you to select a new supervisor password. If you have not yet registered Internet Password Lock, this option will appear on the top of the window. Clicking on it will display the registration screen, which also appears when you first run Internet Password Lock until it is registered. If you need help with this program, have found a bug, or have a request for additional feature, please contact Leithauser Research. The best way is to send an email to Leithauser@aol.com. You can also call Leithauser Research at 386-410-6769 or send a fax to 386-740-7699. If you are suggesting an additional feature or other improvement, we will make these changes and release a new version soon if we believe these improvements would have broad appeal. You will be notified when the new version is released. If we feel that the changes you suggest are not commercially viable, we can still create a custom version of Internet Password Lock for you for a fee. Contact Leithauser Research if you are interested in this.